Hey Ernie, why you look so glum? Heck, not only can you afford a haircut, now you can buy the whole danged barbershop. Perhaps he's contemplating the 1.9+ million long-lost relatives and old friends he's about to meet. Playing the BIG machine by an emergency exit door — who plays those machines? He is pissed about the taxes. 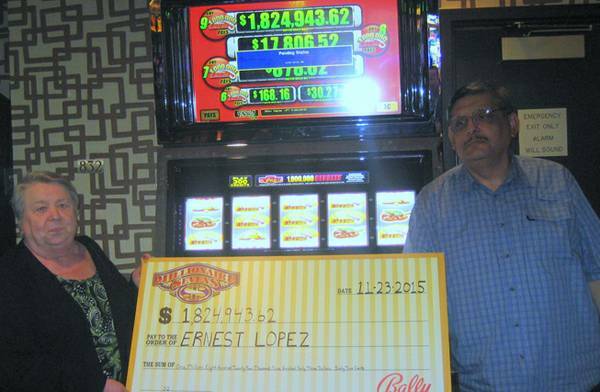 Ernie is the "honey badger" of jackpot winners! I haven't been to Laughlin in some time, but I have to say the quality of the cocktail waitresses, as evidenced by the one on the other side of the picture from Ernie... is improving. The article says thats his girlfriend..... Probably not for much longer. He's still down a $100.